A walk to discover the four castles of Naples, ancient fortifications with magnificent exteriors and beautiful interiors. Spend a day in Naples it is certainly a short but intense experience that one can also live by immersing oneself in one tour among its castles, fortifications whose history is partly also that of the city. I'm four structures that you can visit in this beautiful walk, starting from Castel Sant'Elmo with its panoramic position on the Vomero hill, passing through the Castel dell'Ovo, place of legends, and the imposing Maschio Angioino, until the Castel Capuano which for years was also the seat of the Naples court. Each of these castles has distinctive characteristics and the interior spaces that can be visited represent one journey in the unique military architecture of the city with beautiful towers, bastions, prisons, cannons, but also frescoes, historical halls, libraries and a Civic Museum. The tour starts from the hill of Vomero with the first castle of the day, the medieval Castel Sant'Elmo, which dominates the city of Naples from above. To reach it you can get to Vanvitelli stop with the 1 metro line and continue on via Scarlatti, the stairs of via Morghen and the Belvedere di San Martino; or with the Funicular you arrive at the Piazza Fuga or Morghen stop, you reach via Morghen and continue along the same route. Castel Sant'Elmo is one of the most important examples of 500 military architecture, is the largest in the city, is built with the characteristic Neapolitan yellow tuff and inside it houses the Museum of the twentieth century with collections of contemporary art. It was built on the remains of a Norman observation tower and, because of its strategic position, anyone who has ruled over Naples has always tried to seize it. Although the first news on the Castle are of the 1329 with Roberto d'Angiò, its current architecture with the plant star-shaped 6 tips dates back to the first half of the '500. Over the centuries it has suffered numerous sieges, but only in the early seventies of the '900 has become a military prison, while in the 1988 it was opened to the public as a museum and sometimes even special events are organized. Today both the interior and the suggestive can be visited Piazza d'Armi with the panoramic terrace and the corridors inside the ramparts. From the entrance, to get to the top, you must follow a steep ramp that leads to a bridge followed by the Cave of the Hermit where once lived a hermit. Continuing, you can admire the portal in piperno with the coat of arms of Carlo V and a guillotine gate a little further on, while on the left there is the second entrance ramp. In this area you can enjoy a first one enchanting view of the city through a side window, while a few meters further you can visit the former prisons. Finally, arrived on the beautiful Piazza d'Armi crosses the Torre del Castellano and you can finally take the corridors of the ramparts that offer a fantastic view of the city, the most complete on the historic center, the sea and the islands of the Gulf. After the visit to Castel Sant'Elmo we reach the second stage of the tour, the Castel dell'Ovo. With the Funicolare Piazza Fuga we get off at the Augusteo stop, continuing on foot along Via Toledo to Piazza Plebiscito, via Chiaia, Piazza Vittoria and along the promenade to the castle. È the oldest in Naples and rises ontufaceous islet of Megaride, where Partenope was founded in the 8th century. AC, making the panorama of the Gulf even more suggestive. 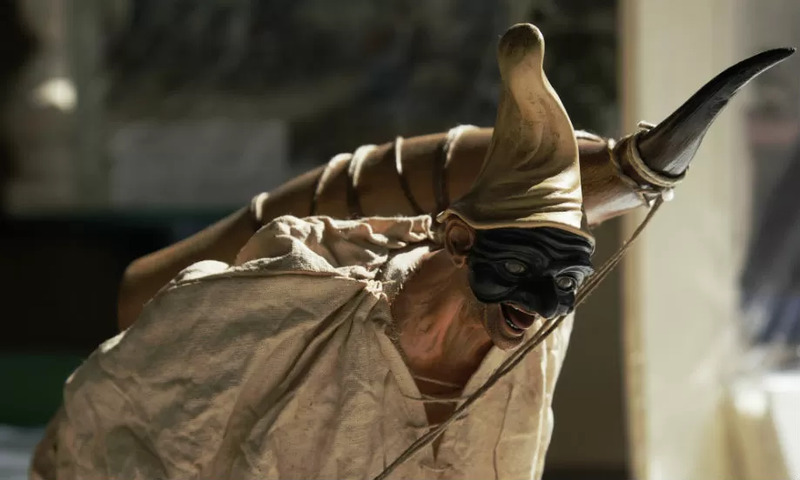 Its current appearance is very different from the original Norman one because of the many historical events that have interested him and the gods Angevin and Aragonese alterations. We talk about this fortification in a document of the 1128, but already in the previous centuries there stood the enormous villa of Lucullus, which later became a fortified structure and a convent complex. Furthermore, the famous is linked to Castel dell'Ovo legend of the egg of Virgil, which gives its name to the structure, according to which the poet hid an egg in the dungeons to keep intact the fortification; if the egg were to break, the castle would collapse and various misfortunes would hit the city. The visit to the castle leaves you breathless because both the path to climb and the terraces at the top offer one spectacular view of the Gulf and the city. In the internal walkways there are various panoramic views and the paths lead to the Sala delle Colonne, which is perhaps the old refectory of the monastery, and to the prisons and, during the walk, you can also see the old monks cells carved into the rock and five rows of columns of the villa of Lucullus. This internal road also crosses the Norman Tower, the only one still visible, beyond which there is the Church of the Savior, one of the two sacred buildings of the islet of Megaride (of the second there are no more traces). Once you reach the terrace you can also admire them two large black cannons of Spanish origin. From here the view of the city, as mentioned, is incomparable and it is advisable to spend a few minutes to enjoy it fully. The tour continues with the third castle, the Maschio Angioino or Castel Nuovo. To reach it, just take a walk on Via Nazario Sauro, via Cesario Console, cross Piazza Plebiscito and walk along Via San Carlo. The imposing castle, which dominates Piazza del Municipio, is located a few steps from the Port and flanks the gardens of the Royal Palace. 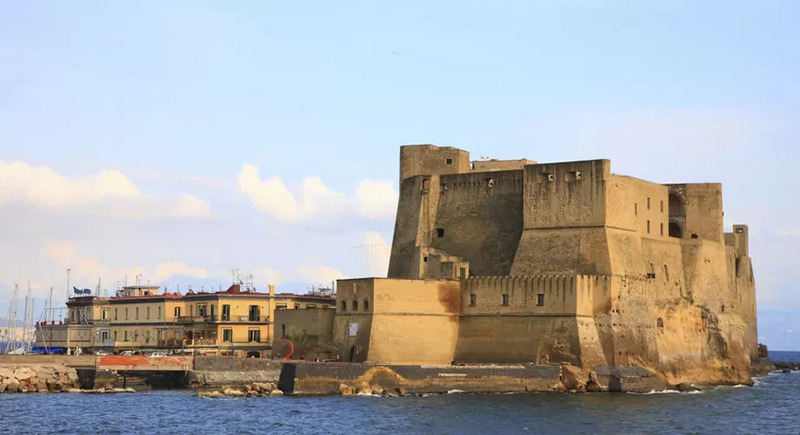 It is one of the symbols of Naples, a medieval and renaissance castle whose construction is due to Charles of Anjou in the 1266 that decided to add to the Castel dell'Ovo and Castel Capuano this new fortification not only as a defensive structure, but also as a personal palace. Unfortunately, he never managed to live there and was with the Aragon that a court was established there and the castle assumed thecurrent appearance. His style is Catalan Gothic and there are five round towers, four in piperno and one in tuff, while the imposing one entry arch it was built in the second half of the '400 and represents a masterpiece of the Neapolitan Renaissance in white marble, recalling the Roman triumphal arches. The flower beds that surround it were made in the twenties of the '900. The visit includes the civic Museum Hall of the Barons and Palatine Chapel. The latter, also called the church of "San Sebastiano" or "Santa Barbara", is the only surviving element of the Angevin structure and was frescoed with Giotto's works, of which very little remains today. Other frescoes present part of the Florentine school or recall the gothic-Avignon culture, but in the Chapel there are also very precious sculptures. La Hall of the Barons, where it happened in the 1486 la conspiracy against Ferrante I of Aragon, is the main hall and has a beautiful octagonal vault that forms a star design. On one side there are a large fireplace and two stages for musicians and the bas-relief depicting theentrance of Alfonso V of Aragon in the Castle. Il civic Museum it houses works from the Baroque, the Renaissance, the Neapolitan 800, paintings by Caravaggisti, and frescoes from the 15th to the 18th centuries. Finally, you can visit the Hall of the Armory and Sala della Loggia overlooking the arsenals. Prezzi: ticket for the entire Civic Museum 6 euro | reduced 3 euro. Admission to the castle is free to visit the courtyard, the Sala dei Baroni, the Cappella Palatina, the Sala dell'Armeria and the Sala della Loggia. Sunday entry may not take place every week, check by calling. From Maschio Angioino you can reach Castel Capuano along Corso Umberto up to the intersection with via Pietro Colletta that leads directly to the structure. The Castel Capuano is, after the Castel dell'Ovo, the oldest in Naples and it was also Headquarters of the civil and penal sections of the Court of Naples. It is a castle of Norman origin and its name derives from its proximity to the famous Porta Capuana. He was the king of Sicily William I to order its construction in the second half of the twelfth century and immediately the fortress became home of the royal family. It was built on remains of an ancient cemeteryIn fact, during some excavations of the nineteenth century there were found many tombs. With Federico II the appearance of the castle changed and became more dignified for a royal family by losing some of the characteristics of a fortification. With the construction of the Maschio Angioino, Castel Capuano he lost his vocation of royal residence, despite some members of the family and various famous guests continued to stay there. With the advent of the Spanish Vicereamefinally, it became the Palazzo di Giustizia e underwent various architectural renovations both outside and inside, while the dungeons became prisons. Outside there is an entrance portal with one plaque commemorating the victory of Charles V in Tunis surmounted by a large bicep eagle, coat of arms of the sovereigns of Spain. After the portal you enter a courtyard with a portico that is the nucleus of the castle, a place where judges, lawyers, witnesses and defendants met. Once inside, you can start the very impressive visit in one of the most beautiful rooms, the Court of Appeals Hall which presents eighteenth century frescoes representatives allegories on the provinces of the kingdom. On the first floor there is the Hall of busts in which you can admire the busts of the most important lawyers of the forum and also here they are present beautiful frescoes. From this room we arrive at the Sala della Sommaria built around the middle of the '500, while in what is currently the Library are kept around 80000 volumes of the sixteenth, seventeenth and eighteenth centuries. Together they represent the Ancient Fund. Timetables: Monday to Friday from 9.00 to 18.30. Times may vary, always contact the property for confirmation.